People are very, very loyal to their stuffings. I learned that the hard way once (insert story about me gravely offending an entire group of people as I obliviously bagged on icky, soggy stuffing for, like, 4 1/2 minutes). It’s pretty obvious that I don’t like soggy stuffing. Or soggy anything, really. It kind of creeps me out. I’m more in the camp of: soft and tender stuffing with some crunchy, croutony bits on top. I know that’s not necessarily a popular Thanksgiving opinion what with classic stuffing often being packed into the bird and all and baking up very, very, very soft. But the fabulous news about stuffing (especially homemade) is that the bones of a recipe is what makes it a winner. The spices and flavors and aromatics and vegetables and add-ins and bread. If you have that in place, it’s usually as simple as adding more or less liquid depending on how…I almost said icky and soggy but I’m trying to be mature here…soft you want it. 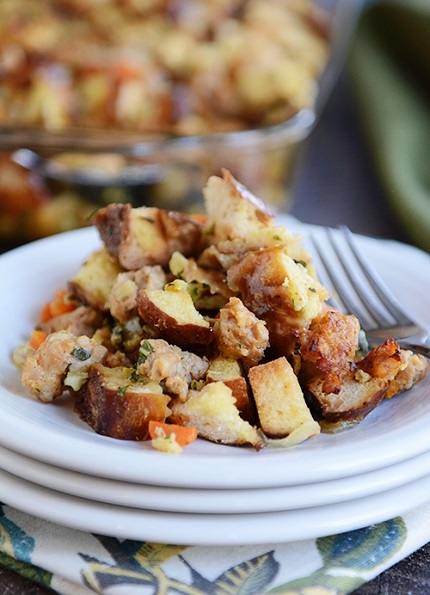 I decided shortly after last Thanksgiving that while I very much love this classic, delicious stuffing, I wanted to change it up a bit with pretzel rolls and sausage. Because yes, I’m the one already plotting next year’s dinner before the current Thanksgiving spread is all the way devoured. 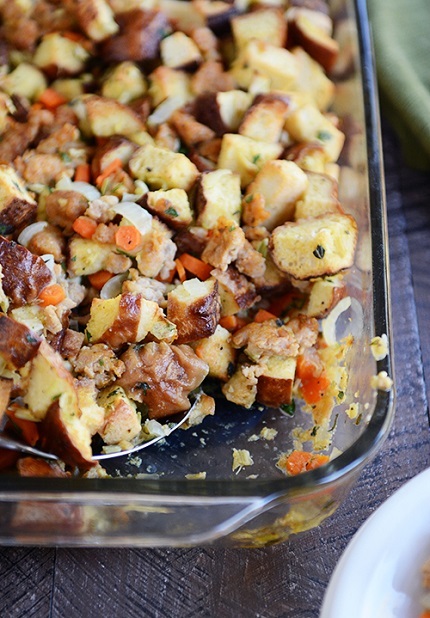 This reinvented stuffing is fantastic and everything I hoped it would be after dreaming about it for 11 months. Those chewy little bites of pretzel rolls (storebought or homemade) make me so very happy, especially the crunchy ones right on top. With the tender vegetables and yummy sausage, there’s just a lot to love here. For make-ahead options, the bread cubes can be toasted a day or so in advance; let them cool completely and store at room temperature in a ziploc bag or other airtight container. The bread/vegetable/sausage mixture can also be prepped several hours (and quite possibly up to a day) in advance and placed in the prepared 9X13-inch baking pan (refrigerated until needed) so that before baking, all that needs to be done is pouring the egg/broth mixture over the top.